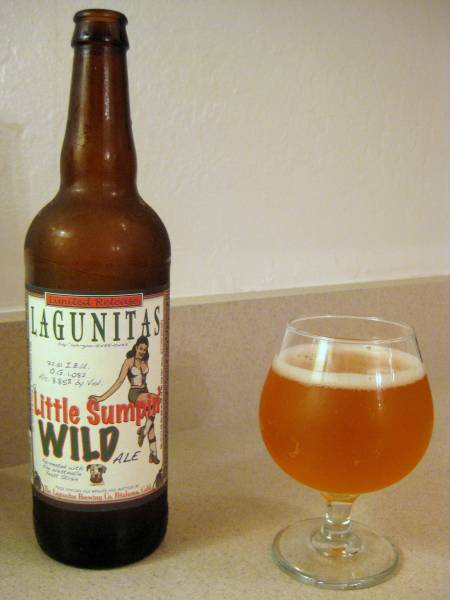 A Little Sumpin’ Wild Ale is a summer seasonal version of Lagunitas Brewing Company’s Little Sumpin’ Sumpin’ Ale. It’s higher gravity, meaning that it has more booze in it. It comes in at around 8.9% alcohol by volume, so it’s a strong brew. It pours a nice golden orange color with a thick white head. The nose is a lot of citrus, spice, cloves, with a hint of bubblegum. It has an interesting taste. They describe it as a Belgian IPA and I can see why. I get a lot of pine and citrus with the spiciness you’d expect from a Belgian Ale. It’s delicious. I wish it was available year round, that’s why I’m not complaining that I found a summer brew in the middle of November. It’s one of my favorite beers from one of my favorite breweries.